It’s no secret that drivers from Fairbanks like you want to get the most out of their new Toyota car. And why wouldn’t you? That’s why the Toyota Service Center at Kendall Toyota of Fairbanks staffs trained technicians to keep your Toyota car, truck, or SUV in tip-top shape. Our secret? First: the training. Our team knows the ins and outs of your vehicle because they’re trained to understand everything that makes Toyota Camry, Toyota RAV4, and Toyota Tacoma models tick. Second: our team is equipped with the latest Toyota certified parts. After all, your car deserves nothing less. If you’re interested in seeing what we can do for your car, feel free to fill out our online contact form to set up an appointment. Or, if you’d like to speak with us as quickly as possible, feel free to either give us a call or to visit us at 1000 Cadillac Ct, a quick drive away from North Pole, Fort Wainwright, and Delta Junction. Kendall Toyota of Fairbanks is proud to offer the highest quality in automotive service and repair. While we are a Toyota dealership, our qualified technicians are here to provide exceptional service, no matter the make or model of your vehicle. So bring in your Honda, Audi, Ford, BMW, or anything in between. We know vehicle problems tend to happen at the worst possible times. Life doesn’t stop when your vehicle does; that’s why our Fairbanks auto shop is here for you! From oil changes to transmission replacements, Kendall Toyota of Fairbanks Service Center has you covered. We’ll make sure you get to wherever you have to be while your vehicle is in our care, whether that is work, school, or home. Kendall Toyota of Fairbanks offers complimentary shuttle service when you drop your vehicle off and when it is once again ready to hit the road. Tires: We always check your tire condition and adjust tire pressure. Be sure to rotate your tires every 15,000 miles to maximize their use. Brake Service: We visually inspect brake linings/drums and brake pads and discs every 5,000 miles. We’ll check your brake lines and hoses at 15,000 miles through our multi-point inspection. At 30,000 miles we will measure your brake linings/drums and brake pads/discs. Oil Change: Schedule your oil and filter to be changed every 5,000 miles. One of the most important components of an effective team is skilled leadership. This is why at Kendall Toyota of Fairbanks, we have Michael Bushke leading the crew. Michael brings over 10 years of experience to Kendall Toyota of Fairbanks to ensure your vehicle is in safe and qualified hands. Our team provides the highest level of Toyota service to our customers, whether it’s your first time visiting Kendall or you’re a longstanding Kendall customer. 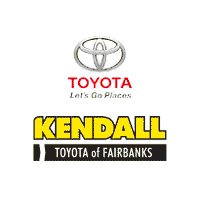 Give us a call to schedule service with Kendall Toyota of Fairbanks.